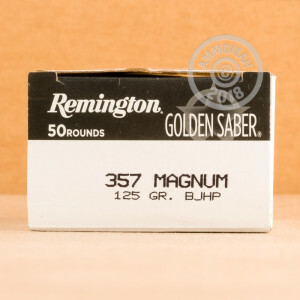 You need an cartridge that you can depend on for your everyday carry, and this 357 Magnum load from Remington’s Golden Saber line of ammunition represents that to a T. This round’s casing is plated with nickel to protect it from corrosion and let it cycle smoothly, and its primer and mouth are waterproofed. If you ever have to draw your weapon in the dark, you can take heart that this round’s propellant emits a low muzzle flash, so your eyes will still work to let you make fast and accurate follow-up shots. All that wouldn’t be much without a hard-hitting projectile. 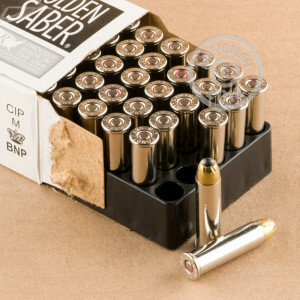 This cartridge’s 125 grain bullet dons a brass jacket, which is even harder than copper gilding metal so it can bust through medium barriers without deflecting and release superior energy after having traveled a great distance. Once within a target this bullet’s broad hollow point and the spiral cut serrations around its tip work together to ensure wide expansion, creating a catastrophic wound channel that’ll make a threat a threat no more. This bullet isn’t prone to overpenetrate either, making it relatively safer to fire where you must consider the safety of innocent bystanders.